The Akshi descends from a variety of the Egyptian known as Baladi. The Akshi is a brachyceros type similar to the Jaulan, only smaller. They can be black, brown, yellowish-brown, occasionally grey, and black pied — with about 30% of the population being naturally polled. The Akshi is well adapted to dry areas with little rainfall and is resistant to tropical diseases. They will tolerate low level management and have a long reproductive life. 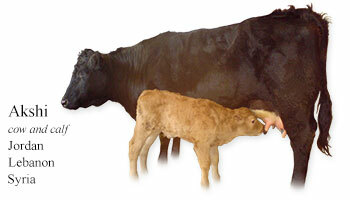 But, in Syria, many calves do not survive because milking starts immediately after parturition. My Daily Cow® Jordan, Lebanon and Syria and read about other Jordanian, Lebanese and Syrian cattle breeds.